This Friday was my great friend Patti's birthday. I don't usually know what to get her, and she would rather people not make a huge deal about her birthday. But I decided to make her something this year. 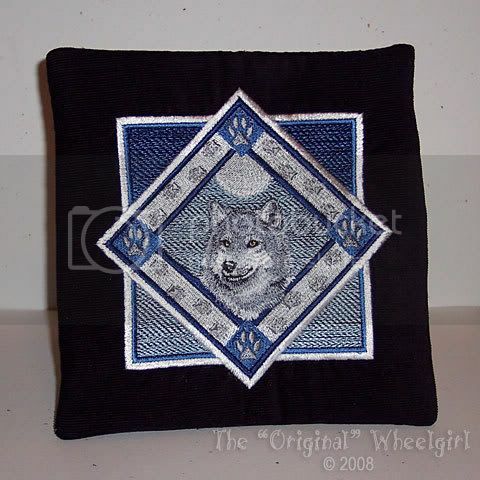 She likes wolves, and I found a beautiful embroidery design of a wolf over at Embroidery Library. I used the concept of Joan Hawley's (Lazy Girl Designs) Perfect Pouches pattern to make a small pouch to put whatever in. It is about 8 inches square, and is made from a velvety corduroy I picked up at A.C. Moore. I used fusible no show nylon mesh as a stablizer for the embroidery, and used the hoopless method to do the stitchout, as I was afraid of hoop burn (marks on the nap of the corduroy). However, I just used a simple tearaway and spray adhesive, and the denseness of the design caused the tearaway to rip away and there was serious puckering. But when I cutaway most of the mesh stablizer the puckers lessened and weren't as noticible once the pouch was assembled. Next time I will use a cutaway stablizer and really stick the fabric to it and baste it in place, so it won't pull away. All in all it was a beautiful stitchout and Patti was happy. She likes handmade items because she realizes the thought and feeling that goes into making something for someone. How nice! I really like the simplicity of the Perfect Pouch pattern. The zipper installation method is ingenious! And you can make them any size you want. That's the best part! The gift for Patti is beautiful. You did a great job coordinating the threads, embroidery design and fabric.